Okay, maybe not that last part, but he is extremely talented. 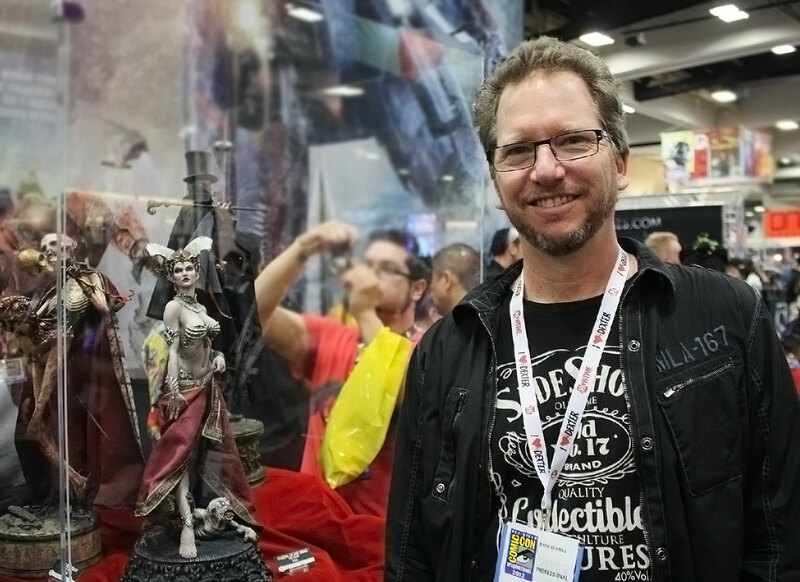 With an incredible sense of design and keen eye for detail, sculptor Mark Newman has more than a few tricks up his sleeve, and is always ready to bring that extra something special to the table for Sideshow. From beautiful women to grotesque monsters, Mark’s talent has been showcased in a multitude of Sideshow pieces over the past five years, with popular characters from DC Comics, Marvel, The Lord of the Rings, Pacific Rim and many more. In this interview, the humble sculptor, teacher, and pug-lover gives us insight on his creative process, thoughts on Sideshow’s new Court of the Dead, tips for aspiring artists and more. Greetings Mark. Let’s talk about your most recent Sideshow debut. We’ve just previewed the Machiko Noguchi Premium Format™ Figure, a human female character from the AVP universe who joins the Predator clan as a hunter. In the same spirit as the Star Wars ‘Mythos’ collection, the piece is an original interpretation, not based on any established material from the films or comics. 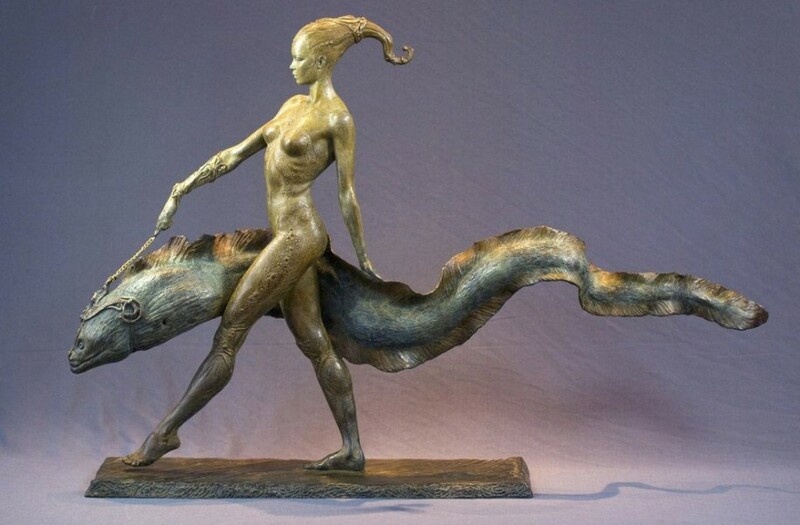 Tell us about the role you had in the design for this statue. 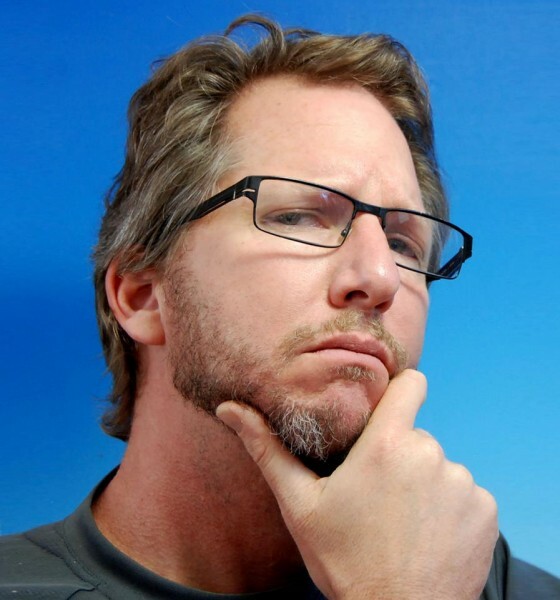 Mark Newman: I wasn’t familiar with this character until she was brought to me as a project, but after discussing with the team and doing some research I was excited to bring my thoughts to the table. I wanted to lace in an Art Nouveau design sense to Machiko’s armor to help support the character’s femininity, with soft flowing lines and organic shapes, while still conveying the strong warrior persona she has. I was also given some opportunity to add in detail design elements of the alien that she has slain. At the end of the day, the most important thing is to stay true to the character and, by extension, the fans. 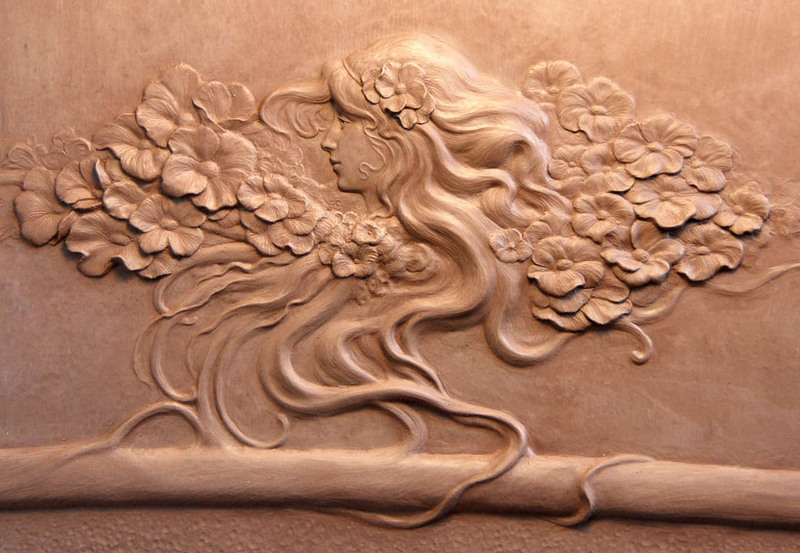 You mention Art Nouveau, and it’s immediately apparent that your personal work and style has a huge emphasis on traditional sculpture and fine art. Which of the ‘old masters’ do you admire most, or look to for inspiration? How do fine art techniques translate or apply to comic book and commercial sculpture? MN: Art Nouveau is a huge inspiration for me and the way I see things. I admire Alphonse Mucha for his design sense and mastery of the female form, and J.C. Leyendecker for the sculptural quality he puts in his paintings. Also Art Nouveau sculptor Edward McCartan, Michelangelo for obvious reasons, and Bernini, are among many others. Studying and understanding the work of the masters, and then channeling the inspiration, design sense, and technique into your own work can produce “good art” in any medium. In my work I constantly think of the overall design of the sculpture; how the eye is directed around the piece, the flow of the pose, the negative shapes around the sculpture, and how they interact. These principles are very apparent in the classic works of the masters and are basically the foundation of good design. Sideshow is very diligent about holding the quality of their products to the level of fine art. They collaborate with the best talents out in the industry today. I know many people on the Sideshow team who work in different capacities, from concept art to sculpt, paint, fabric work, and every one of them draws inspiration from the works of the old masters. Share your experience so far working on the all-new Court of the Dead collection, based on original characters by Sideshow’s Creative Director, Tom Gilliland? MN: Working with Tom and the team he’s assembled for his ‘brain child’ has been a delightful challenge. He has conjured up an amazing number of elaborate and twisted characters with morbid motivations. In addition to sculpting, I’ve been given the great opportunity to do some concept work under Tom’s direction, and in collaboration with other illustrators. To balance out some of the dark and creepy themes, we feel it’s really important to bring out the aesthetic beauty and overall appeal of each character in sculpture. Playing off eachother’s talents and strengths has made for some strong designs and great end results. I’m enjoying the Court of the Dead series very much. 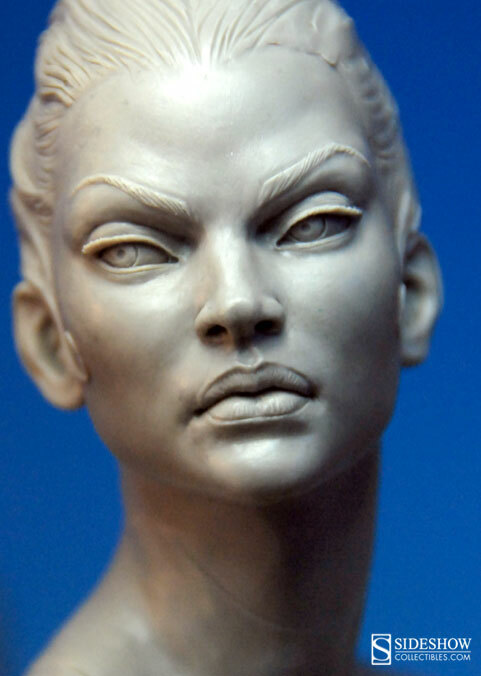 Your work on strong female characters such as Catwoman and Poison Ivy made you the team’s ideal candidate for sculpting the Queen of the Dead. Can you walk us through your process, from armature to finished details? MN: My process for the Queen sculpture was very similar to the approach I take with every character, but with an accelerated deadline for her premiere at San Diego Comic Con 2013 (laughs). At the start of each project I typically receive character design art. Tom had many artists create supporting art for the Queen, but the primary design chosen to drive the sculpture was provided by the very talented illustrator, Ian MacDonald. I begin by creating and posing an aluminum wire armature attached to a wooden base. With a blend of polymer clay, I rough out slimmer versions of the major forms of the figure, leaving the joints free so I am able to adjust the pose if necessary later on, as the basic gesture of a character depicted in concept art almost always gets tweaked a bit during the process of realizing it in actual 3D. I score up the surface of the clay giving it some tooth, and bulk out the muscle groups of the figure, baking parts to solidify them. When the figure is blocked in with correct proportions I shoot off photos to the team at Sideshow for feedback on the pose and flow of the piece in the round, and I will continue to send updates as I go. I applied patterns, lines and textures throughout the piece to help the eye flow around the 3d form in a harmonious way. The sculpt was engineered so the portrait and costume elements could be removed, allowing me to finesse and add fine details. Many of the elements, such as details in her costume and the deformed creatures at her feet were loosely interpreted from the concept art and then evolved during sculpt. Tom will give his ideas and direction and then say “just go for it, do what you do.” That type of collaboration is my favorite way to work. What can we look forward to from the Court of the Dead? MN: The second Court of the Dead statue I worked on is Gallevarbe, a ‘mermaid of death’ that roams the seas in search of her victims to harvest their souls. Sideshow revealed her recently at Monsterpalooza, a convention in Burbank, CA and people went wild for her. Above the water, her appearance is of great beauty and alluring desire, while beneath the surface her true horror is revealed. Mmhuuwhaahahaahaaa! I have also done some concept art and sculpture for a few other characters that will be revealed at San Diego Comic Con this year at the Sideshow booth. Have you taken any photos of you sculpting those pieces? C’mon we won’t reveal too much. 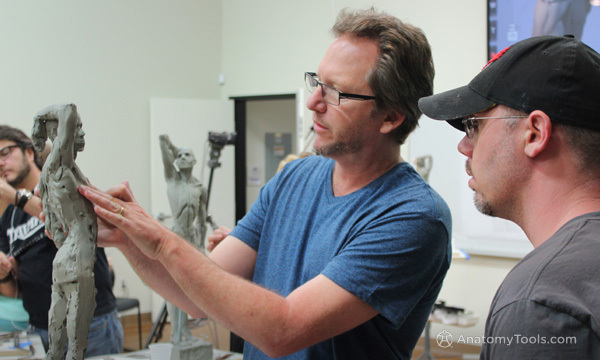 You just finished up guest teaching a sculpting workshop a few months back with Andrew Cawrse. Can you pass on any advice for aspiring artists, or words or encouragement? MN: Of course. 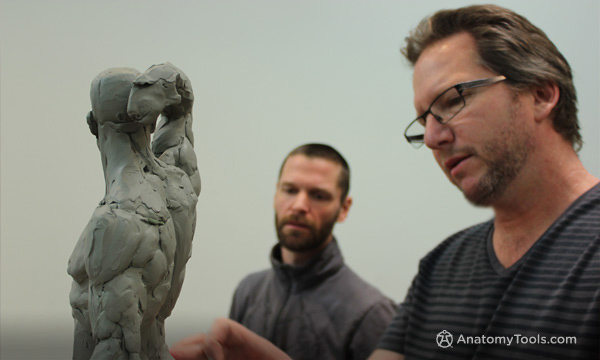 Andrew is one of the leading experts on human anatomy and a world class sculptor, and his company, Anatomy Tools, provides some of the best anatomy reference utilized by professional artists around the world. In these intensive workshops I help students hands-on while Andrew does lectures and demonstrations. This was my third time working with Andrew and I have loved being a part of workshops for artists of all levels. They are only offered once a year so check them out on the Anatomy Tools website. Practice as much as you can every day. Draw every day. If your passion is sculpture, traditional or digital, drawing will only strengthen your understanding of form and design, as well as get the juices flowing. Look to other artists work you admire for inspiration, and study their work. The internet is full of tutorials blogs and forums to help each other network, learn and get inspired. Try to attend conventions and workshops to network with fellow artists and keep up with the latest and greatest. Join us for a super Mother's Day giveaway!